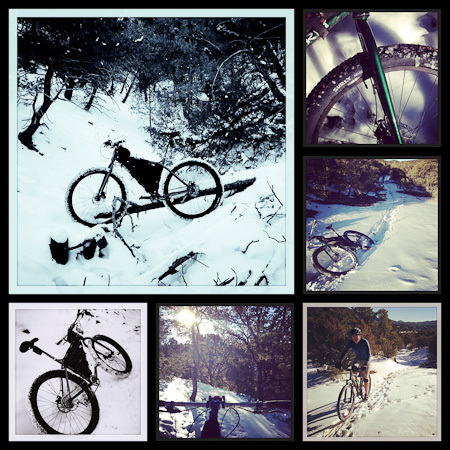 This entry was posted in New Mexico and tagged Surly Krampus on December 14, 2012 by Cass Gilbert. Winter is fun. Successful fat-Knard tubeless today. Winter is very fun. Lovely – you could almost sell those as Christmas Cards for bike nerds. Winter is fun? Get back to me in a couple months… 🙂 Too bad we can’t expand the photos, patiently waiting for the new website. I think the Krampus could be be the ideal ‘in between’ bike, for places like Santa Fe that see snow, but not in Coloradan/Alaskan proportions. I ran the tyres super low (sub 10 at the front) on the the ride we did in Dale Ball, and it made a real difference. Far less squirrelly than a conventional 29er, and it could even negotiate powder snow inclines. I’m sure it’s not in the same league as a fully fledged fat bike in terms of flotation though.